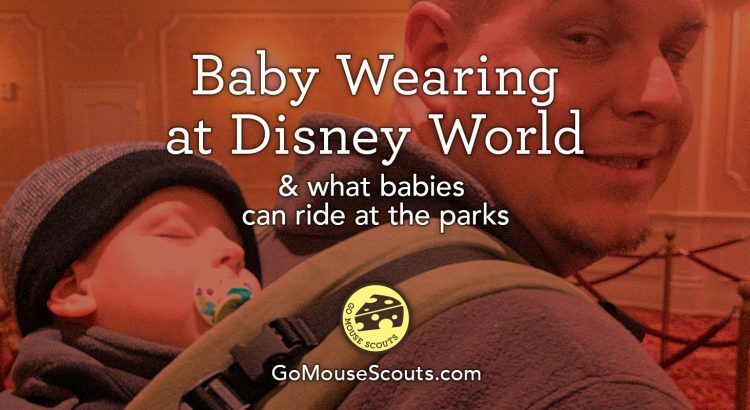 Baby Wearing and What Can Babies Ride at Walt Disney World? Imagine being able to carry your napping baby around with you while you travel around Walt Disney World and still be able to experience some of the rides! We’ve done this on many occasions having gone on two, sometimes three different rides and nobody had to stay back with the napping baby. How is this accomplished? Through the magic of baby wearing! Even if you brought your stroller to cart your stuff, you can leave it in one place while you go around the land visiting attractions and shopping without shoving a stroller through crowds and small spaces. Your baby is in their favorite spot: right next to your heart. He can turn to you for comfort when scared or overstimulated. When he’s sleepy, he can just snuggle in and doze off and you can continue to experience attractions. Hands-free (or mostly) nursing, with practice. Save your back and arms when standing in a long line—which you will be doing without the stroller. A properly fitting and adjusted carrier shouldn’t hurt. Everyone can do it! 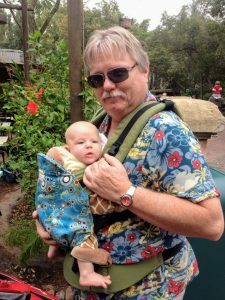 We were visiting Disney World with Nonna & Ompa (Megan’s parents) and Ompa even took a turn wearing our little one. We had a problem. 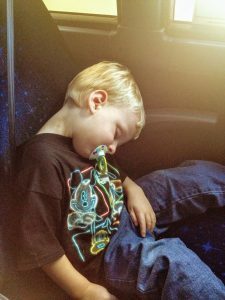 We were on day two of our Disney World trip and our son had lost his last and only “sucky,” which is what we called his pacifier, and therefore we couldn’t get him to sleep. Huge problem when you’re planning to make the early magic hours at The Magic Kingdom the next morning! There’s the pacifier in question. Argh!!! I can read your mind. You’re asking, “Why in the world would you only have one pacifier?” It seems a little backstory is in order. At the time, our son was two years old and we had decided that we were going to try to retire his sucky and therefore weren’t going to buy anymore as they got lost or needed replacing. The plan was to have him completely done with pacifiers before our Disney World trip because get this: we thought it would be easier to not have to worry about pacifiers on our trip! Well, things always go according to plan, right? Wrong! The date for our trip arrived and we had one pacifier remaining. It almost seemed like he’d anticipated hanging onto that last one just so he could lose it on Disney property. Now that we’re up to speed, let’s get back to the situation at hand. There we were, our son wasn’t sleeping without his sucky, and to complicate matters even more, he was in an unfamiliar environment, in a different time zone, subjected to a disrupted schedule, and exhausted beyond measure from our trip so far. There was one item in the world that would solve our problems and it was gone! I think you probably know what we did next. After all, a family vacation wasn’t the place to stick to our guns on the pacifier retirement plan. I went down to the gift shop at our resort, looked for, and found our son’s brand, and bought not one, but two suckys for him. He was out like a light within two minutes upon my return to our room. 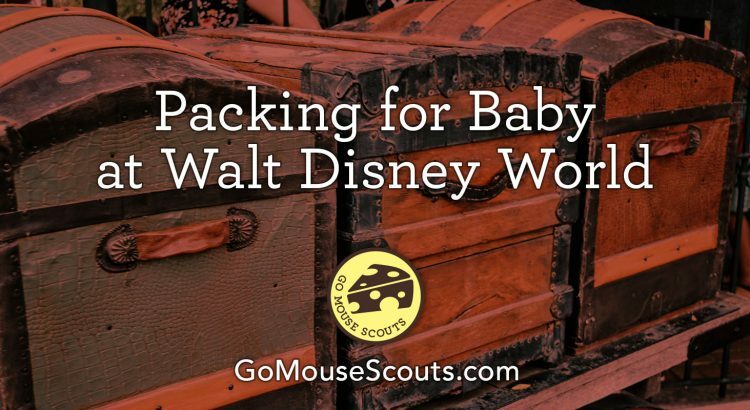 Are you getting ready to pack for Baby for your Walt Disney World trip? There’s a lot to consider and so many factors in play that can affect what you bring along. Are you flying or driving? How long is your trip? How light or heavy do you want to pack? We’ll break things down to everything you might want to consider for your trip as a whole, and then what you’ll want to have daily in the parks with you. 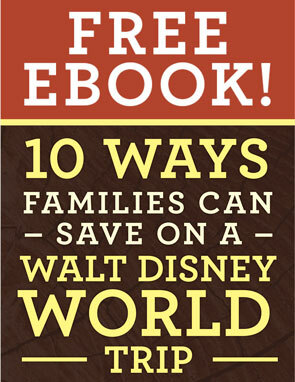 Get Our FREE Ebook: 10 Ways Families Can Save on a WDW Trip! Sign up for our email newsletter and we'll send you our Free Ebook: 10 Ways Families Can Save on a Walt Disney World Trip! We'll also keep you up to date on our latest posts, news, and contests.